The Messenger – a Spirit Guide | Does This Font Make Me Look Fat? Helen Delaney, a member of our Tuesday night Working Writers’ Forum, has had a spirit guide for years. Last Tuesday she came in carrying a box. Her face was alight with excitement as she handed us each an inscribed copy of her new book. Helen has been working on this book for a long time, and our Forum has seen it evolve over several years. We even critiqued versions of her back cover text below. It just makes you want to read this book. “Helen Delaney is in a railway book store, inconsolable and suicidal after the death of her son. A book at eye level catches her attention. She touches it, and it falls off the shelf, into her hand. It is a set of instructions on how to connect with a spirit guide. 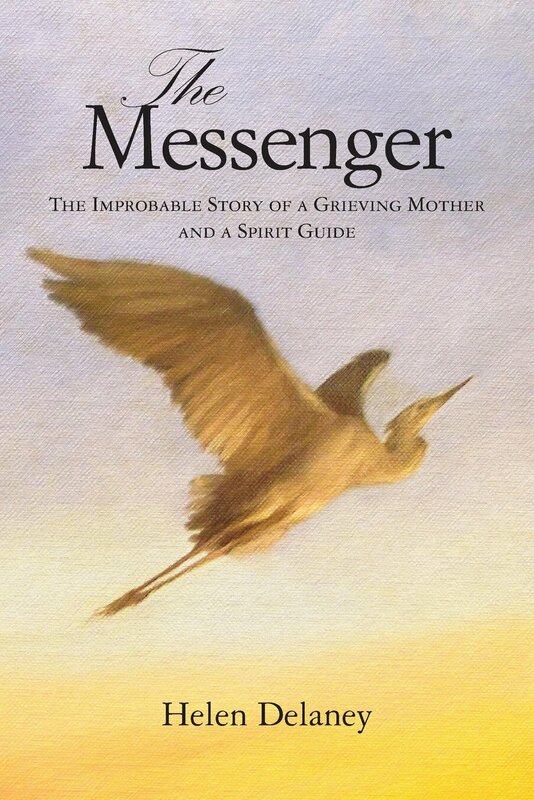 Thus begins The Messenger, the true, intimate story of a grieving mother, a gifted medium, and the spirit guide, Lukhamen, who keeps her alive by recounting the story of his life. It is 214 AD, and the Egyptian city of Luxor is ruled by Rome. The last vestiges of Egypt’s glorious past are discernible in the deteriorating temple dedicated to the god Amon, and its high priest, Lukhamen’s father. A Roman centurion, hopelessly in love with the wife of the high priest, becomes governor. A sadistic Roman underling seeks to unseat him, while lepers and beleaguered Christians struggle to survive in this unprecedented account of the end of an era. Above it all, and against the tide of history, Lukhamen, nine years old when the story begins, is expected to be the next high priest, and a light unto his people. One of my favorite books over the years is Mika Waltari’s The Egyptian. So any story of ancient Egypt hooks me. But Helen’s book has two stories: that of the grieving mother and the Egyptian story channeled to her by a spirit guide. Both are compelling in different ways. When Helen first brought chapters to Forum it was just the Egyptian story. It took her awhile to share that the story was about her own experience. Laura and I were hooked. We even went with Helen for readings by the psychic she’s gone to for years. That was something on my bucket list. He told me our scripts would sell soon. Well, it hasn’t happened yet, but Helen tells us that time is fluid for psychics. Our advice to Helen, once we knew this all had really happened to her, was to include her story in the book. She found it difficult to expose her raw emotions, but she was convinced her story might help others who had suffered terrible losses. Ultimately, both Helen’s and the Egyptian story are stories of grace and healing. But here’s the best new thing. Laura and I (and the rest of the Forum) are mentioned in the author’s acknowledgements. That’s a first for me and for Laura. I encourage you to buy Helen’s book. If it were a work of fiction, it would be a great read. The fact that it actually happened makes it remarkable. This entry was posted in Laura Ambler, Mala Burt, Novels and tagged ancient Egypt, channeling, Helen Delaney, past lives, spirit guide, The Messenger, writer's group by Mala Burt. Bookmark the permalink.